Just taking a quick look at huge commercial fishing vessels there’s a sudden feeling that Spielberg could use them in one of his masterpieces. Up-to-date electronics allow captain to investigate and monitor the area beneath the vessel in order to detect every single fish. That’s the technology applied, when a huge boat has to deploy huge nets, a bunch of hooks, miles of lines, and catch the whole school of ever-scarcer fish in a single sweep. Everything else in the way is caught as well. Once the waters of a particular region are empty, the vessel moves to the other. That’s the process of “overfishing.” In other words, the conversation is about the serial depletion of scarce fish by too many fishers. As a result, too little adult fish is left within the water region that may not be enough to repopulate the seas. So, what do the experts say regarding the future of the World Ocean? In accordance with the United Nations Food and Agriculture Organization report, the fishing industry is worth more than $200 billion. Its products serve as the source of 20% from the total protein consumed by 3 billion individuals. Beyond a shadow of a doubt, this is an important industry that impacts people all over the globe. But the prospects for the world oceans don’t seem to be positive, with some experts cautious that this invaluable industry will most likely fall down by 2050. With so many problems threatening the global oceans, overfishing has already damaged many species like Sturgeon and Bluefin Tuna, and a lot of them will most likely be extinct in the nearest future. The species mentioned above are already on the list of the category called “Large Predatory Fish” that has been 90% overfished. Due to the sky high price this fish sells for, the companies have already switched to the non-stop fishing mode. 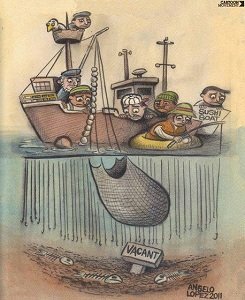 But the problem is that the increase in the number of fishing boats does not mean that the catch will increase. What’s more, the increase in fishing vessels leads to the so-called “by-catch.” The term is related to the process of “various unwanted sea creatures caught during commercial fishing for particular species.” The marine creatures tossed overboard usually range from little turtles to inedible fish. This is not only harming the fishing industry, but also destroying the species with long reproductive cycle. Apart from overfishing, various industrial activities like bottom trawling, have already caused serious damage to the sea beds. According to the UN Secretary General, exactly the bottom trawling stands behind more than 95% of the damage done to the world ocean ecosystems. If humans are about to save the life in the world oceans, changing the mentalities and fishing industry practices is a must. The current trends will most likely lead to the fishing industry collapsing. Securing thriving life in the sea depends on how effective the agencies like FAO and UNEP will turn out to be, when the conversation will be about international treaties. The latter can limit catches, ban the bottom trawling and manage overfishing. This overfishing essay has been written by WorldEssays.com writers. Food and Agriculture Organization. What Is the Code of Conduct for Responsible Fisheries? Rome: FAO, 2001. Mason, John. “Over-fishing Threatens Developing World.” Financial Times, November 1, 2002. WWF Annual Review 2006. Rep. World Wildlife Fund, n.d. Web. 01 Mar. 2013. Overview: Major Trends and Issues. Rep. Food and Agricul ture Organization of the United Nations, n.d. 7 Mar. 2013. Morishita, J. “What Is the Ecosystem Approach for Fisheries Management.” Marine Policy 32.1 (2008): 19-26. Froese, R. et al. Generic harvest control rules for European fisheries. Fish Fish. 1–12 (2010). Worm, B. et al. Impacts of biodiversity loss on ocean ecosystem services. Science 314, 787–790 (2006).